The Padua University Botanic Garden is a must-see Padua attraction if you want to spend a couple hours both relaxing and informative, walking around among over 6000 plants, bird songs and didactic placards. The Botanic Garden of Padua, Italy, was founded by the Republic of Venice in 1545, and it is the most ancient University botanic garden in the world. It was created in order to grow medicinal herbs and plants, to let University students of the time learn in the field about plants and their therapeutic effects: at the time gardens of this type were named Hortus simplicium, stressing the fact that they were simple healing herbs obtained directly from nature. 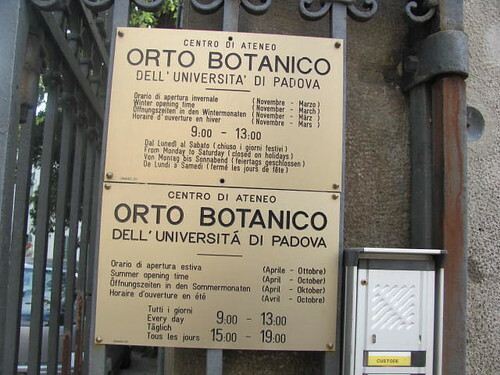 A library and laboratories were built beside the garden, for the Padua University students to put into practice their studies of botanic science. The Padua University botanic garden was little by little enriched with plenty of different species, native of different countries and continents, but mostly coming from those countries connected with the Republic of Venice, both for political and commercial reasons. For this reason many exotic species were brought for the first time to Italy just by Venice, which played a relevant role from this point of view. Out of curiosity, some of the plants brought by Venice to Italy for the first time were potatoes, sunflowers, acacias, jasmins. I love sunflowers, and chips too, so thank you Serenissima! When you’ll be there in the botanical garden, pay attention to its beauty from the architectural point of view as well: Venice wanted it to be a monumental garden, not merely a scientific center. The garden is characterized by a strict symmetry, typical of the Italianate gardens, and features a circle enclosing a square, which in turn is divided into 4 quadrants, each of them hosting plants and herbs. Over the centuries, besides being more and more enriched with new plants, the Padua University botanic garden was embellished with fountains, which date back to the late 1500’s. In 1704 it was the turn of four gates with wrought-iron plants upon them. Decorative statues too were put inside the garden during the 1700s. Allow about 1-2 hours for the visit, but of course it depends on how passionate you are about botany. If you are a botanic student you might spend all day observing plants and reading their didactic placards in detail. Do not forget to take the brochure with the map at the entrance! Goethe palm: it is the oldest tree in the garden, planted in 1585. It is known by the name of the German writer after he studied this palm in 1786, while carrying out a study about evolution, then published on its essay Metamorphosis of plants. Other trees in the garden date back to the 1600s, like a huge plane tree planted in 1680, with its hollow trunk caused by lightning. Others date back to the mid 1700s, like a gingko and a magnolia. From November to March: every day except on Sunday and holidays. Open at 9am-1pm.